16 Aug 2016 Washington D.C.
Republican presidential nominee Donald Trump slammed Hillary Clinton as “America’s Angela Merkel” during his detailed policy speech on the threat of radical Islam. As Breitbart News has previously reported, if elected president, Clinton’s policies could result in the permanent resettlement of close to one million Muslim migrants during the first term of her presidency alone. 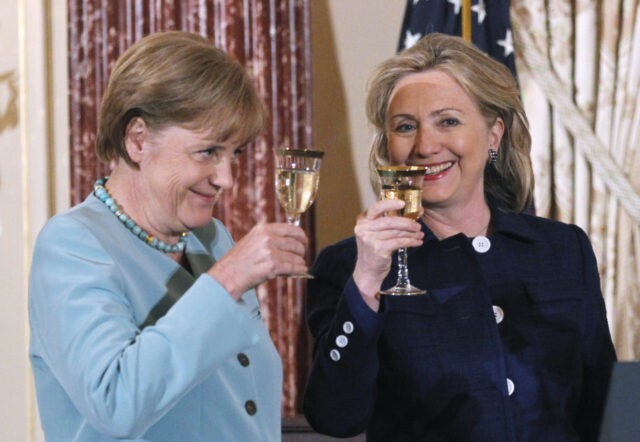 Under two terms of a President Hillary Clinton, the U.S. Muslim population could exceed the current Muslim population of Merkel’s Germany. During his speech, Trump explained that, “the size of current immigration flows are simply too large to perform adequate screening” for migrants from terror-prone regions of the world. The United States Senate Subcommittee on Immigration estimates that Hillary Clinton’s plan would mean roughly 620,000 refugees from all current refugee-sending nations in her first term, assuming no cuts to other refugee programs. This would be additional to all other non-refugee immigration. The Subcommittee estimates her plan would impose a lifetime cost of roughly $400 billion when you include the costs of healthcare, welfare, housing, schooling, and all other entitlement benefits that are excluded from the State Department’s placement figures. In the Cold War, we had an ideological screening test. The time is overdue to develop a new screening test for the threats we face today. In addition to screening out all members or sympathizers of terrorist groups, we must also screen out any who have hostile attitudes towards our country or its principles – or who believe that Sharia law should supplant American law. Those who do not believe in our Constitution, or who support bigotry and hatred, will not be admitted for immigration into the country. Only those who we expect to flourish in our country – and to embrace a tolerant American society – should be issued immigration visas. To put these new procedures in place, we will have to temporarily suspend immigration from some of the most dangerous and volatile regions of the world that have a history of exporting terrorism.